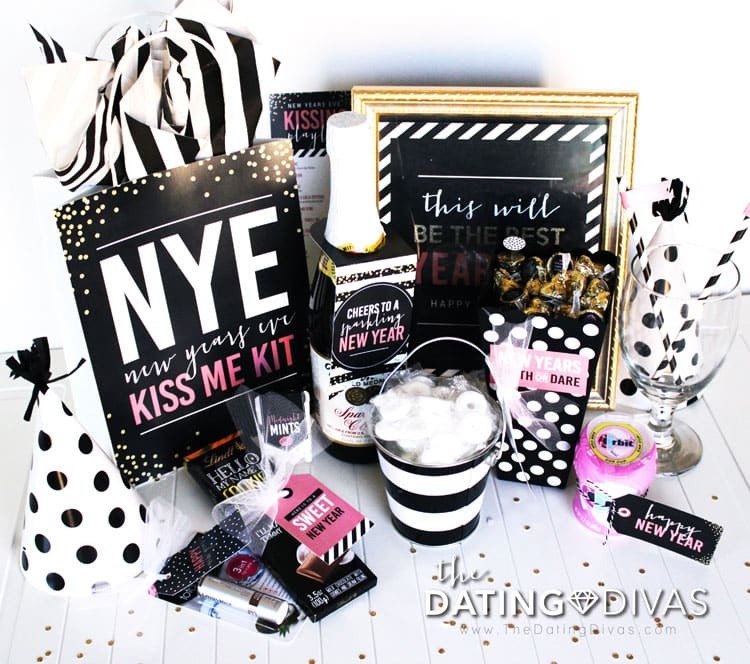 Today we are sharing the most adorable New Year’s Eve idea that is guaranteed to help you get the perfect “midnight kiss” from your sweetie! 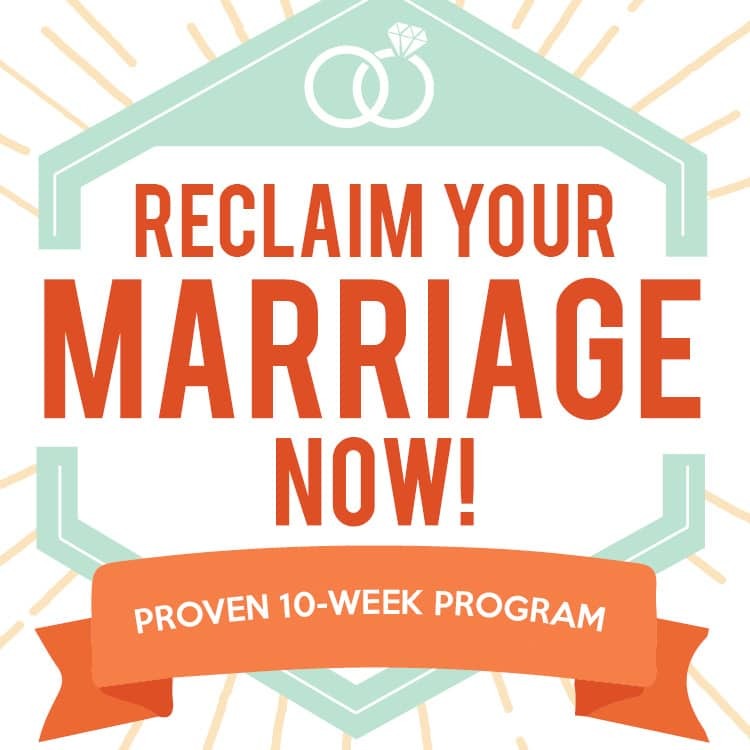 It’s quick, easy, AND romantic! 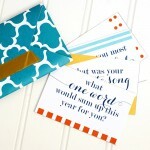 PLUS, it comes with darling, totally free printables! Doesn’t get much better than that! Gum: What is a “midnight kiss” without fresh breath?! Pop Rocks: Add a little “spark” to your New Year’s Eve make-out sesh! 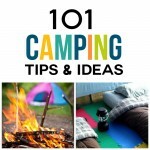 Candles: You know… to set the mood (WINK)! Lip Balm: Trust us…you will be glad you added this later! 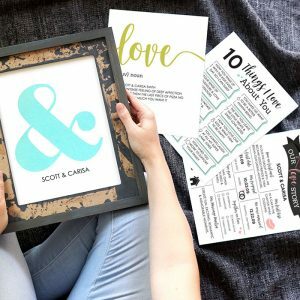 New Year’s Eve Framed Print: Put our darling New Year’s Eve printable (found below) in a frame and take a picture while holding it with your spouse! Wint-O-Green Lifesavers: Did you know these actually spark in the dark when you bite them? They totally do! Try it out with your sweetie the New Year’s Eve! Kissing Playlist: Make your own or check out our darling printable below! 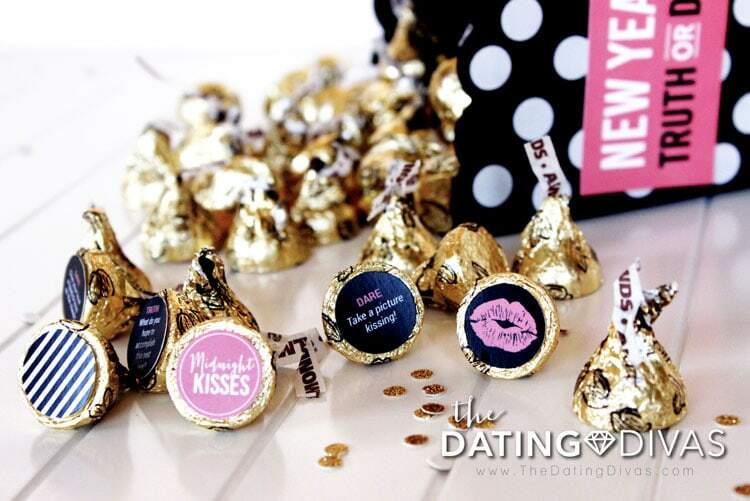 Kissing Truth-Or-Dare: You will love playing this New Year’s Eve game while you wait for the clock to strike midnight! 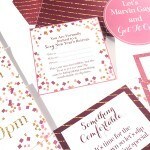 Once you have decided what you want to include in your Kiss Me Kit, print off our cute New Year’s Eve printables, and cut. 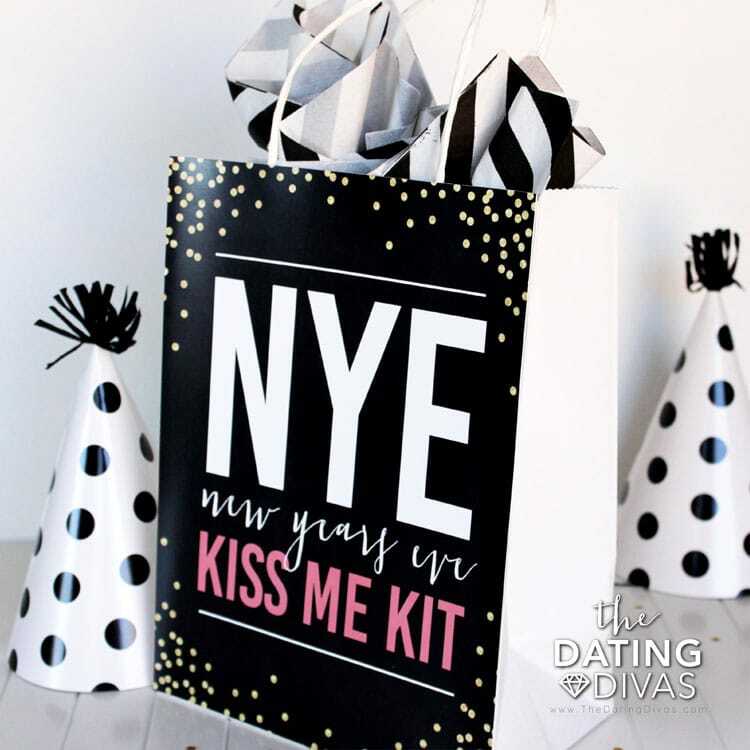 Start by attaching our adorable New Year’s Eve Kiss Me Kit printable to the front of a gift bag! We made sure to include a bunch of festive tags to help you decorate the items in your bag! 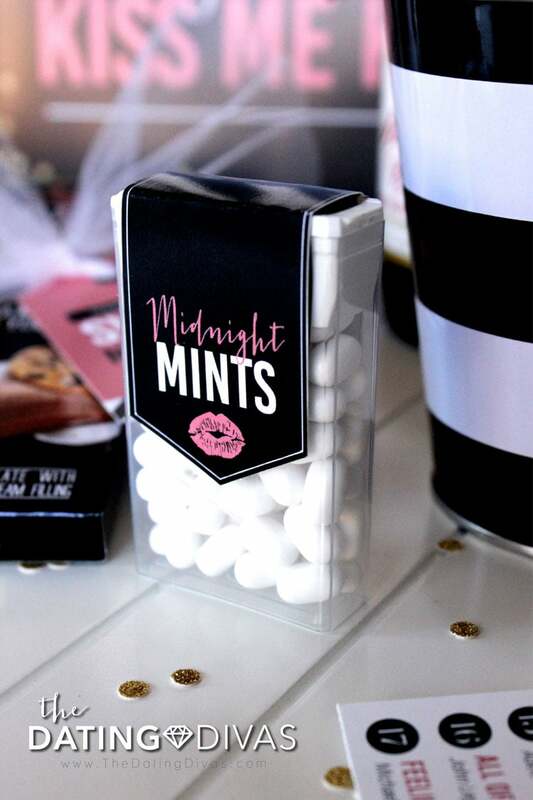 Attach this cute printable to a box of breath mints to create some delicious “midnight mints!” These are the perfect snack for when the clock hits 12 (WINK)! Nothing says romance like Martinellis! 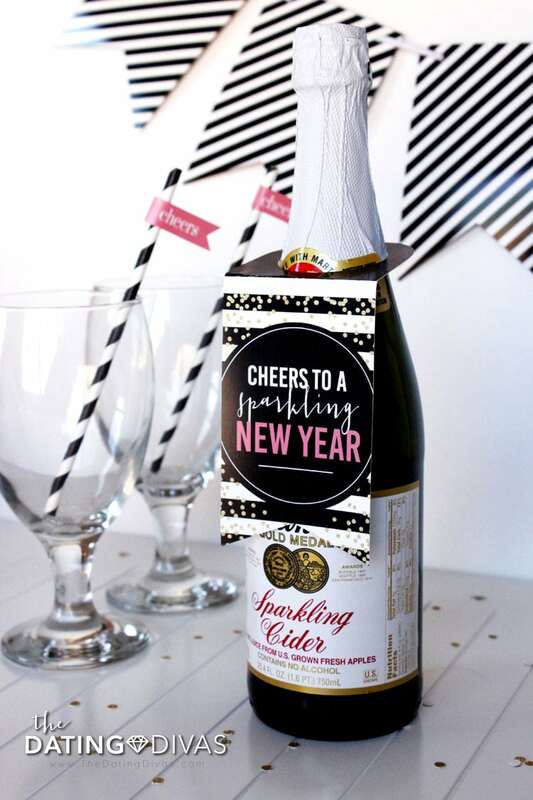 We are totally in love with this cute printable tag designed for a delicious bottle of sparkling cider! Sip your sparkling cider with some cute paper straws! 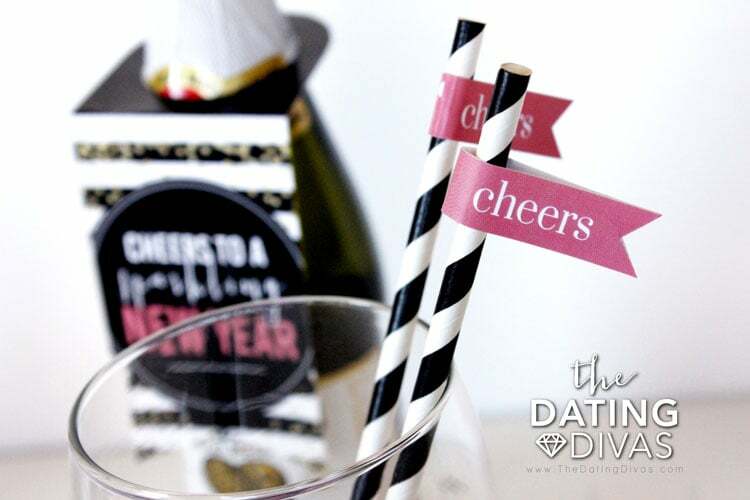 We have even included some free printable straw toppers to add a little flare to your drinks! 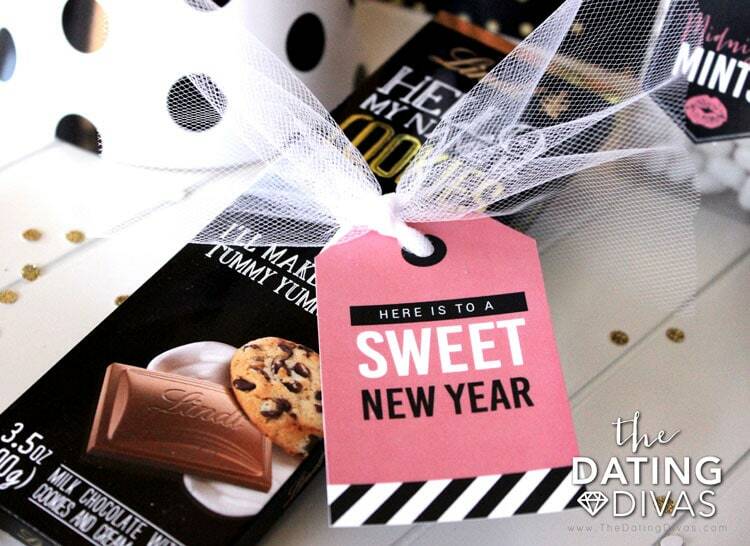 Don’t forget to include something sweet in your New Year’s Eve Kiss Me Kit! What would be a New Year’s Eve Kissing Kit without some great music to set the mood!?! 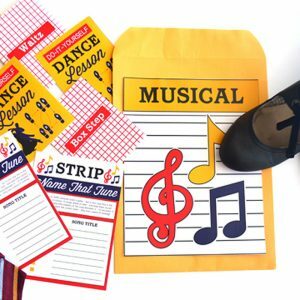 You can either come up with your own songs or check out our printable playlist! We put our heads together to come up with the ULTIMATE music selection, specifically for New Year’s Eve! 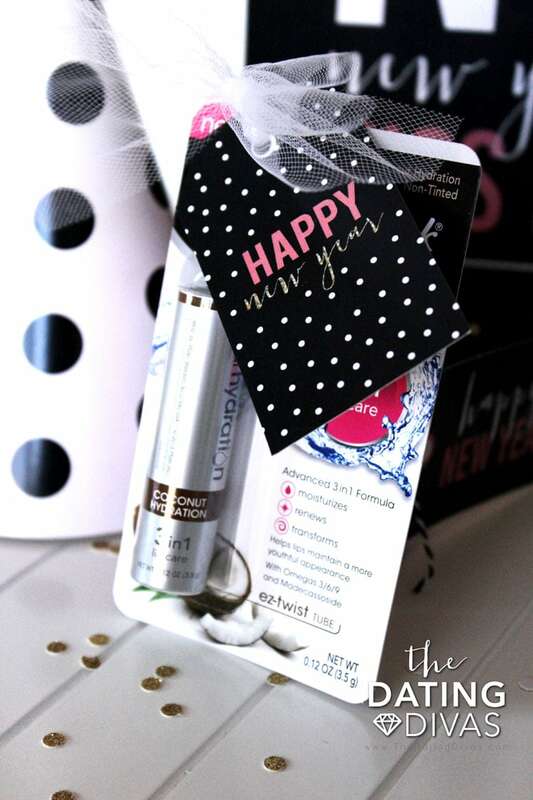 Trust us when we say you are going to want to include some lip balm in your New Year’s Eve Kiss Me Kit! 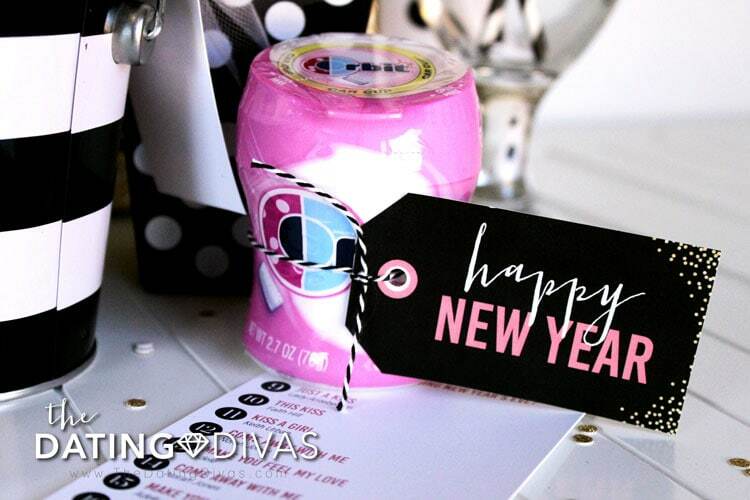 Be sure to attach a cute printable tag! 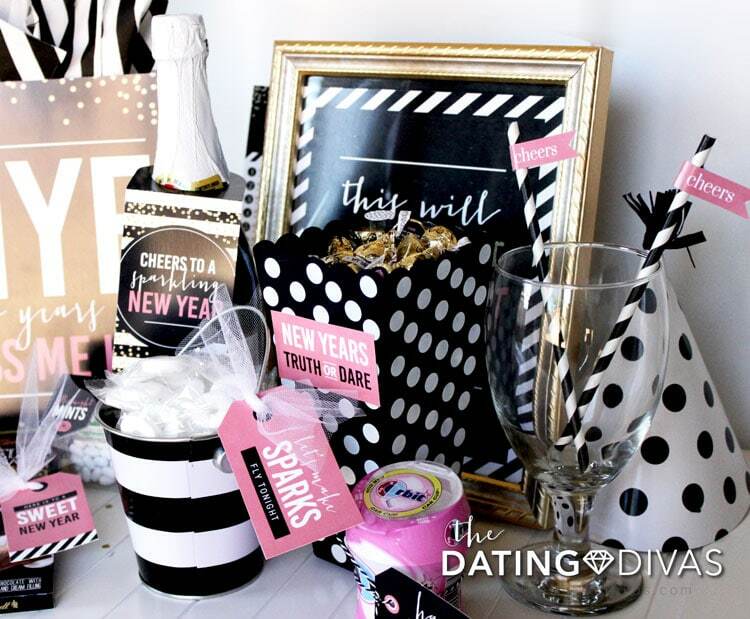 Because we are The Dating Divas and LOVE to make things fun, we also came up with a SUPER cute Truth-Or-Dare Kissing Game! This game is the perfect New Year’s idea if you are looking for a little romance as you ring in the New Year with your sweetheart! 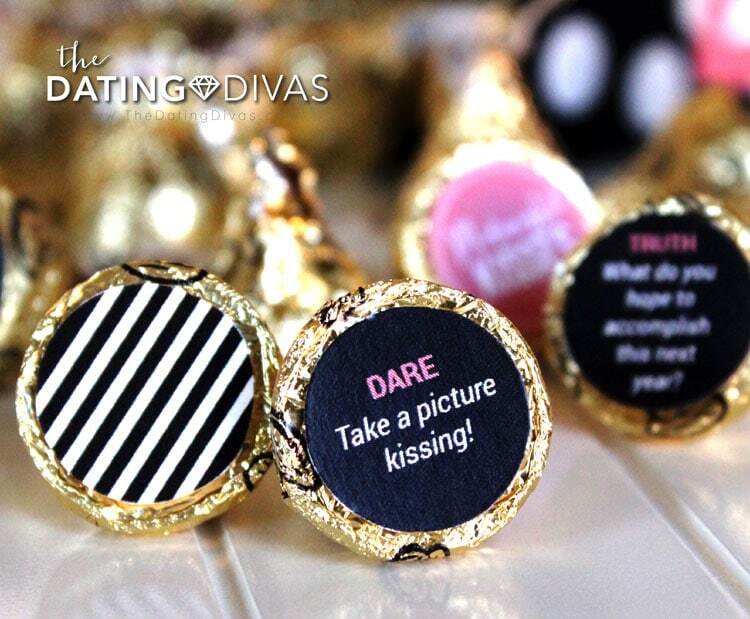 Simply adhere our cute Truth-Or-Dare printables to the bottom of some Hershey Kisses. 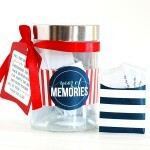 Take turns drawing kisses from a jar! Have fun together answering questions and performing dares as you await midnight! 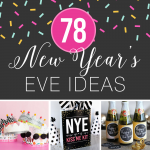 Looking for some more New Year's Eve ideas? 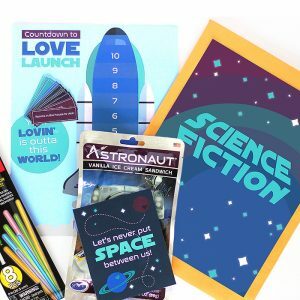 Don't miss out on our POPULAR New Year's Eve Countdown Bags or our amazing post including 50 New Year's Eve Party Games! 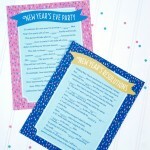 You can also check out our “New Year's Eve Ideas” Pinterest board! 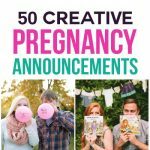 It is full of festive decorations, party ideas… and SO much more! I love, love, love everything about this but for some reason the link won’t work for me. Your other links always work for me but this pdf doesn’t seem to. I’d love to use these for New Years. Hi Skye, thanks for letting us know! We contacted the designer about the issue and will fix it as soon as we can. Sorry for the inconvenience! Dying over the cuteness of this! My sweetie and I are spending New Year’s apart this year, but I’m definitely pinning it for next year!!!! Love it…. Did you have a list of the truth or dare questions? Hi Jill! So glad you love this! You can see the truth or dare questions in the pdf! 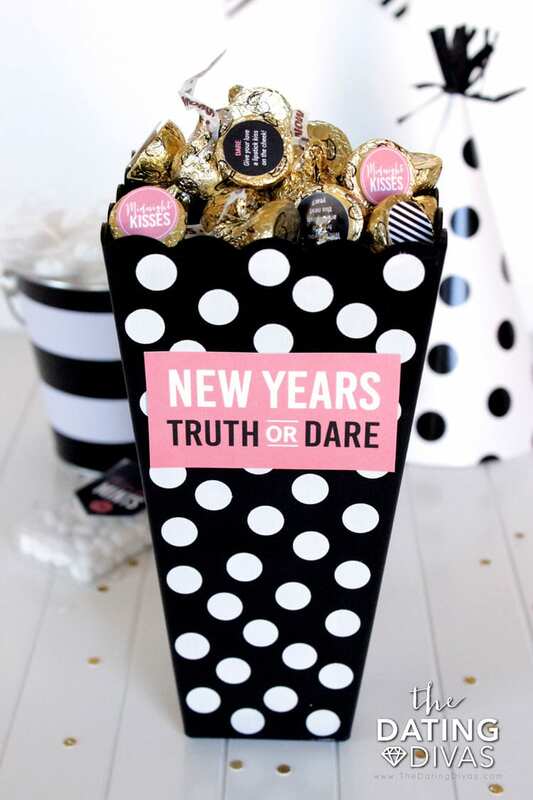 They are on the page titled “truth or dare kisses” and you cut out each circle and glue them to the bottom of hershey kisses. Have fun!! 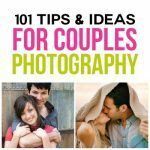 You should do an updated version of this, just for an at home date night! I love this idea! It definitely adds some fun leading up to New Year’s!! This would be a fun gift! Such a fun way to start the new year, right?